my juicy little universe: poetry friday brought to you by..
poetry friday brought to you by.. Still there is time to be still. This is my Happy New Year, full of resolutions. Do you have any resolutions for the new school year? We're all on different schedules, of course, but I think for many of us Poetry Friday brings a weekly opportunity to pause.just stop. and notice. Here's the menu of our noticings this week...there will be a lengthy midday break to allow for boating to The Paradise Grill, so eat hearty so you can last until Happy Hour! Steven joins us with big news about his collection Crackles of Speech. Congratulations, Steven! I'm so glad Robyn enjoyed my Summer Poem Swap offering--she's posted it at her blog. Thanks, Robyn. Carol offers us a New York City skyline poem, and is getting ready to unveil her Summer Serenity online gallery. Karen gives us some of what we need today, by David Budbill. Diane, another participant in the Summer Poem Swap, is posting all her lovely poetry gifts at Random Noodling. At Kurious Kitty, Diane concludes her "restaurant week" celebration with an Amy Lowell poem. Michelle of Today's Little Ditty has a visit from Renee LaTulippe today, doing her Lyrical Language thing. Tara joins us with reflections on the news from Ferguson, MO at A Teaching Life. More on this week's news comes from Jone, who is remembering Robin Williams. Happy Birthday to Matt's youngest daughter who is ONE today! He celebrates with a poem for Phoebe at Radio, Rhythm & Rhyme. Violet joins us with an original called "Ant" over at her blog. Tabatha offers a poem that is "pretty close to a thousand years old." I thought she meant that figuratively, like an old one from her files--but no, she means it literally! Find it at The Opposite of Indifference. Renee at No Water River returns to blogging with poems from J. Patrick Lewis's new book. Everything is a poem, if you look at it right! Mary Lee really does have an old poem from her files at A Year of Reading. It's to her students and it flows! From Catherine we have an original about freckles! Carol is also getting ready to hit the ground running at school, and is in with a poetic picture book text at Carol's Corner. Irene joins us with a look at Janet Wong's Night Garden (one of my favorite books ever)--and her new puppy! Laura PS is also highlighting J. Pat's work at Teaching Authors--"What a Day." Sorry for the previously incorrect link! 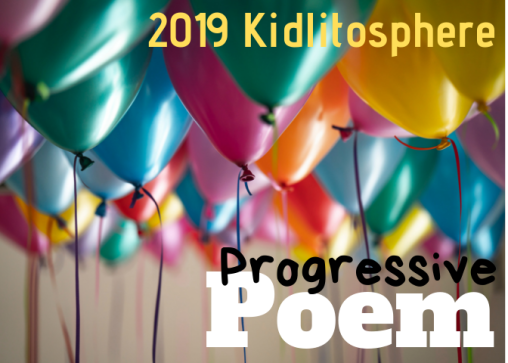 At The Logonauts, Katie shares a wrap-up of her haiku series with favorite haiku picture books. Catherine has "I Am Poetry" by Pam Muñoz Ryan at Reading to the Core. Everything is a poem and I am too. Anastasia joins us with beach thoughts "On Kiki's Reef" by Carol L. Malnor at Booktalking. And finally this morning, over at TeacherDance Linda shares two Summer Poem Swap pieces by Tabatha! First, apologies to Sylvia over at Poetry for Children--I "misplaced" her link this morning. She has a reading and teaching guide for the novel in verse by Margarita Engle about the opening of the Panama Canal--Silver People. Little Willow of Bildungsroman has both an interview with YA author Kelly Jensen and a little Emily Dickinson for us--and if you scroll down you'll find a mind-blowing list of the people she has interviewed on her blog! Janet shares Avis Harley's "Sea stars: saltwater poems" at All About the Books. At Kelly's blog there's a review of an awesome anthology of poems by 19th century African Americans. And last for today, McHugh at Free Range Readers offers up a poem from a Naomi Shihab Nye anthology. Let's raise a glass to all the times we can enjoy being still to notice, and let's wish them to all others whose lives allow these moments less often. Crackles of Speech: Poems by Steven Withrow is here! Thanks for hosting, Heidi! I'm in this week with a David Budbill poem. It's here. Hi Heidi! Thanks for hosting this week! At Random Noodling I have my contributions to the 2014 Poem Swap. Kurious Kitty has been celebrating restaurants, chefs, and cooking all this week and ends the week with a favorite poem by Amy Lowell. Thanks for hosting this fling! Thank you for hosting, Heidi! I'm back to blogging and starting off with several poems from J. Patrick Lewis's new collection, EVERYTHING IS A POEM. I'm sharing a poem I wrote years ago and which was buried in a file cabinet at school until this week's cleaning frenzy. Heidi,thanks so much for this important reminder. I'm headed back to do a new teacher meet and greet this morning. Like always, we will hit the ground running, and I'm longing for stillness and time to breathe. I'm going to print your poem and carry it with me. Oh, my! Lovely poem--the enjambments and word play and e.e. Cummings moments! Of course, I'm not a summer fan, but I appreciated the joy and sentiment of savoring NOW. A resounding yes to pausing...stopping...noticing. Yup. My resolution for the year sounds remarkably similar. (see this week's SOL on Tuesday). Thanks for hosting. LOVE the carousel picture! Thanks for hosting, Heidi! I think of August as the beginning of the year, too. Today I am sharing "I Am Poetry" by Pam Muñoz Ryan. Have fun at the beach! Thanks for hosting, Heidi! Love this line: "whizzedblurringaroundfourseasons"
I wish I were on a carousel right now! I published some Emily Dickinson at my blog, Bildungsroman, this morning. My selection is: "Sea stars: saltwater poems" by Avis Harley with photographs by Margaret Butschler. Thanks for hosting. Here is my poem for this week, from one of Naomi Nye's beautiful anthologies. I hope I'm not too late for the party! Thank you for sharing your poem, Heidi. The last verse is my favorite. It's a nice reminder to continue to pause, stop, and notice. I have excerpts from a book by Katherine Applegate entitled "Home of the Brave." These were verses from a boy named Kek, a refugee who loves cows. Heidi, there's food for thought here, the reminder to pause, stop, savor what's left. I like the way your poem is tied to the merry-go-round photo! Thanks for hosting today. I did not share, but will be feasting on the offerings of others!